Leafy suburbs are often the richest most expensive real estate. The trees planted 50 years ago are not the same trees planted today. Poplars, Plane trees and Jacarandas are no longer in the modern landscape tree menu. Good landscape trees make a lot of sense, so what makes a good modern landscape tree, and what are some of the modern popular trees. A good landscape tree has one strong prominent straight trunk that has its branches spread relatively evenly above head height. A good landscape tree is drought tolerant, neat & tidy, and is tolerant of pruning. Safety is another factor, you do not want a tree regularly dropping branches, twigs, fruit or bark, or even too many leaves on the street or buildings below. The root system needs to be safe and not cause the sidewalk to buckle, and they shouldn’t have invasive suckers. Height is another important factor, often shorter trees are needed for under overhead wires or near buildings. A good uniform planting of street trees helps create a pleasing street view. The right choice of tree surrounding houses and buildings can cool the environment, and provide an enjoyable landscape. Trees also improve air quality, reduce noise, stabilise soil and create or contribute to habitat. With smaller house block sizes, and larger houses more compact forms or more shade tolerant trees are often needed. It is important when selecting trees that they are adapted to their intended site and they fulfil their landscape function. These functions may include the shading of yards or buildings, providing a screen to block out a fence or road, to simply provide privacy, to define a landscape area by separating zones, or to form linkages between one building and another. Avenue plantings link an entrance with a large building or in a town and creates a network of tree lined streets. Some trees are used as a focal point for a landscape, where as a single specimen becomes the landscape feature. Planting trees in the right place to achieve the desired benefits is also important. For example, if a house or building has solar panels, it is important not to block them from the sun. It is recommended to put trees further away from the panels, or on the other side of the building where the sun will not be blocked. Often shade is desired for buildings, so finding the right tree with the right height and spread is also important. Selected varieties of trees perform these tasks far better than seed grown trees. One of the main selection points is predictability. Seed grown trees vary in size and spread significantly, making it difficult to predict the ultimate size. The botanical description of Acmena smithii for example has a height range between 1 metre and 8 metres tall, making seed grown trees far too difficult to predict their final height. This height variation is common amongst many seed grown trees. Clonal varieties from cuttings, grafting, or tissue culture provide not only predictability of height and spread, but are generally selected for other improved characteristics. 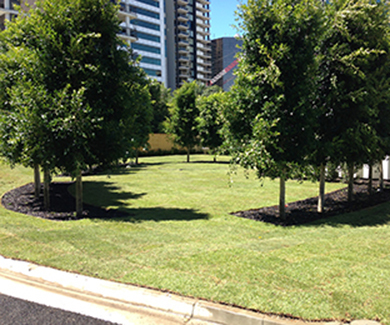 More compact forms, narrow trees, denser screening trees, improved heat or cold tolerance, larger or smaller leaves, foliage colour, new growth colour, disease resistance, and flowers have all been used as criteria to select a better landscape tree. 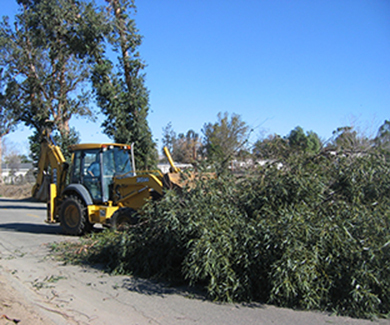 Trees that regularly drop branches such as Eucalyptus types have fallen greatly in popularity in recent years. Foliage is now king, with clean evergreen foliage being far more important than flowering trees. 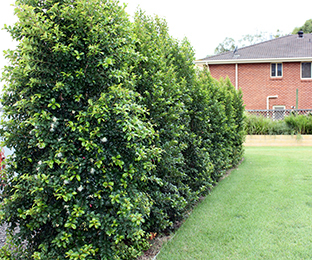 Evergreen trees are simply the most popular landscape trees in Australia including selections of Acmena, Elaeocarpus, Ficus, Magnolia, Syzygium, Tristaniopsis and Waterhousea. Many great cultivars of these tree types have been bred over the last decade, providing uniformity and great selection criteria, making the choice of the right landscape tree far easier. 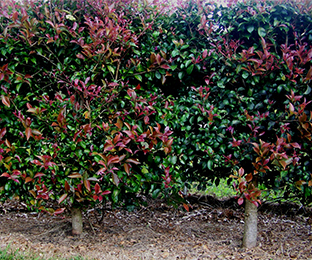 Myrtle rust put a scare into the landscape tree industry, with many growers switching from Syzygium to Acmena or Magnolia. But Myrtle rust has not really caused problems in Sydney, Melbourne, Adelaide or Perth, where Syzygiums are still selling very well. In Melbourne, Deciduous trees are still commonly used, probably due to the cooler winter climate where it is sometimes desirable for the sun to shine through in winter. The most popular types of Deciduous trees for the landscape are Pyrus Cleveland select and Capital, or Ulmus Murrays Form or Todd. Popular evergreen landscape tree varieties that have been introduced over the last decade. The narrow nature of this tree has made it extremely popular as a landscape tree. With blocks getting smaller and buildings larger, there are often many narrow landscape areas that need screening. It also makes a great feature tree when pruned yearly in a conical shape. Although this tree will reach 6 metres or more it can be pruned down to and kept at a height of 2 metres if desired. 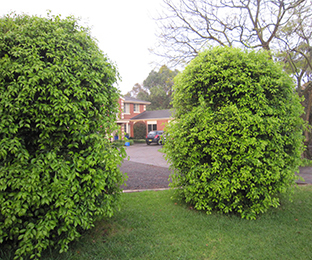 This larger leaf form of Tristaniopsis has become one of the most popular advanced landscape trees in Australia. 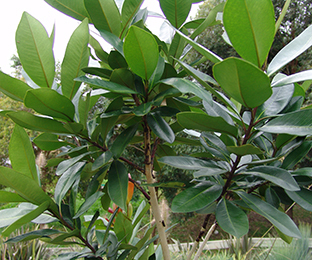 Its larger shiny leaves make it a great native alternative to Magnolia. Its striking bark and red new growth add to its reputation. It is a perfect size for landscape plantings in both smaller yards and large commercial projects, and makes a wonderful shade tree. Its high level of disease and pest resistance and reliability has seen its use grow. It works in most parts of Australia, from tropical areas to colder regions like Victoria. Red Head™ Acmena is an attractive large shrub / small tree with glossy rounded, deep green foliage. New growth flushes red to deep claret than changes to chocolate before hardening off the dark green foliage. The dense foliage can be pruned down to 1.5m high and is fire retardant. This tree is one of the best forms for pleaching. It is highly Psyllid and borer resistant, and does not get Myrtle rust. Its compact size makes it a great shade tree if the first 1.8 metres is cleared on the trunk. It is great for screening or as a feature tree, especially with its beautiful red new growth twice a year. Sublime™ Acmena is a mid-sized tree with refreshing lime green new growth and dense foliage to the ground, although if the trunk is cleared to 1.8 metres it makes a dense shade tree. 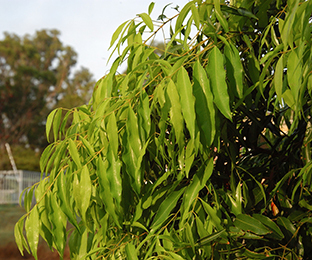 It has proven to be a very reliable plant Australia wide, with excellent Psyllid and Myrtle rust resistance. For screening it is a trouble free plant, and can be pruned regularly, or if forgotten it responds well to harder pruning. Sweeper® Waterhousea is a heavily weeping tree with large clusters of white flowers in summer. It has gorgeous lush new growth and an elegant rippled leaf. It can be used as a large screen, or as a feature tree. It is well suited to humid climates. The unique character of glossy deep green tops of leaves, with a furry brown coloured underside has made these trees very popular in Australia. With a height of 6 metres and a spread of 3 metres it is a good size for modern landscapes.